UPDATE (16 September): Salary has been repaired! This does not mean the full issue is solved. But at least this was solved. 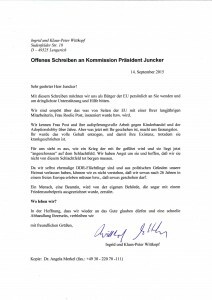 With this letter we address ourselves, as citizens of the EU, personally to you to request urgent support and help. We are upset about what the EU has done, and is doing to their yearlong staff member, Mrs. Roelie Post. We know Mrs. Post and her committed work against child trafficking and the Adoption Lobby for years. But what is happening now with her, leaves us stunned. Her full salary was deleted, and with that her existence, despite her being on sick leave. To us this looks like a war is being faught against her, while she is lying “shot” at the slaughter field. We are scared about her and hope that we will not have to collect her as dead from this slaughter field. As we ourselves are former DDR refugees and left our homeland for political reasons, we cannot understand that we have to live through this 26 years later, in a free Europe, or that something like this can happen. A human being, a civil servant, is being destroyed by its own authority, which even got decorated with the Nobel Peace Prize.